Voted in high school as, “Most Likely to Make Your Day Brighter,” Josh Sanchez sure knows how to put a smile on your face. As a SunWest employee since 2006, Josh has accumulated quite a fan base and it’s easy to see why. Not only is he extremely charismatic, but he also has a knack for making SunWest a great place to work. Whether he’s bringing doughnuts on Saturday or buying pizza for his team, there is no doubt that Josh has successfully transitioned from a Member Service Representative to the Assistant Branch Manager at our Cactus branch. 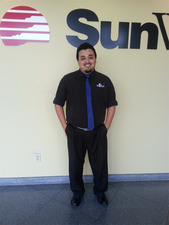 Despite having a degree in Criminal Justice and no experience in the banking and finance industry, SunWest saw something special in Josh and offered him the job as a Part-Time Teller where he began to mold himself into an extraordinary employee. Although Josh has always been motivated to advance his career, he knew his time spent at the teller/branch representative level was invaluable to his future with SunWest. While working under the supervision and guidance of two exemplary employees, Arrowhead Branch Manager Loree Smith and Assistant Branch Manager, Charlita Crane-Coleman, Josh learned the ins and outs of member services and quickly became a member favorite at the Arrowhead branch. Recently, Josh was promoted to Assistant Branch Manager where some of his responsibilities include training, scheduling, daily balancing, and resolving member and employee concerns. Fun Fact: Josh is so well-loved by our members that they travel to his new location at the Cactus branch just to say hi! Why does Josh love SunWest? Easy—the people. Working with members and getting to know them on a more personal level is one aspect of his job that he looks forward to every day. He also understands his role in transforming members into part of the SunWest family as he says, “That daily engagement creates a lasting relationship.” The internal environment at SunWest is another perk to Josh since he truly feels we have created a small-town, family atmosphere where everyone cares about your success and works together to improve the credit union. As a new Assistant Branch Manager, Josh is prepared to help SunWest grow and knows that treating his employees with respect and compassion are the keys to achieving his goals as a leader. When Josh isn’t working, you can usually find him doing homework, playing the ukulele, or relaxing at his family’s ranch up north in St. John’s. He is a big fan of The Walking Dead and even has a soft spot for The Perks of Being a Wallflower. Thanks Josh for being such an awesome part of the team and we look forward to seeing where your ambition and passion for SunWest takes you in the future! Attention recent college graduates: Are you looking for a great place to build a strong foundation for a rewarding career? 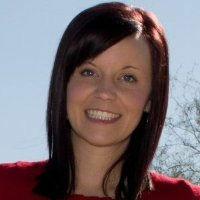 Field Marketing Representative, Katie DeFeo, found just that when she began working for SunWest Federal Credit Union. Graduating with a 4.0 and a Bachelor’s degree in business, Katie felt well-prepared for the‘real-world’ but soon realized why so many of her classmates weren’t as excited about life after college. What does she mean by the right job? Luckily, Katie saw an opening to join our team and jumped at the opportunity to build her career in a fun, supportive environment. As the Field Marketing Representative, she is responsible for maintaining healthy relationships with team members to coordinate events, promotions, and business development efforts. Of course, there is much more to being a Marketing guru but Katie’s favorite aspect of her job at SunWest is the people. “I have always been a people person so working in a friendly, collaborative environment was very important to me when looking for my first ‘big girl’ job. Everyone at SunWest has been great and it truly feels like I am part of a family.” When she’s not working, Katie loves being outdoors and staying active. She also knows how to shop until she drops (literally) and enjoys reading a good book. She plans on going to back to school for her Master’s so she can advance in her career field. She has 3 dogs, Sadie, Maddie, and Ollie, who are more like her kids than furry friends. We are so happy to have Katie as part of our team and look forward to watching her grow into a very successful career in Marketing! Check back next month for more stories from your favorite SunWest employees! This is an expired Recruiting.com Career Site for SunWest Federal Credit Union.